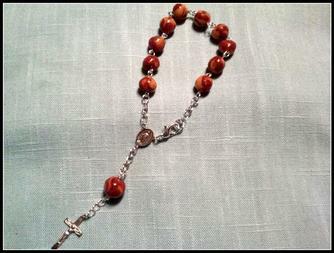 The Rosary is traditionally a set of beads that were orginally made from rose petals. They were crushed and formed into a paste that was formed into beads and dried. The original way preserved the smell of the rose, but the color was very dark- black. They were not very durable. Today we are able to free-dry the petals of the rose and maintain the color. We add clay polymer which allows us to get durablity. Although we are not able to perserve the rose smell, we have developed a lovely bead that holds memories and draws us close. The Rosary needs 5 roses each. 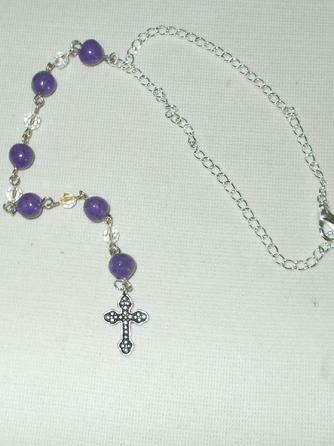 You have the choice of "Our Father" beads done in the rose bead or in Swarvoski Crystals. The cost is $295.00 which includes shipping. This is our Son catcher. It starts at 50.00 for 3 bead, with $10.00 increase per bead.